Who's afraid of the Big Bad Guitars? Big Bad Guitars, Guitar Sample from Nine Volt Audio. 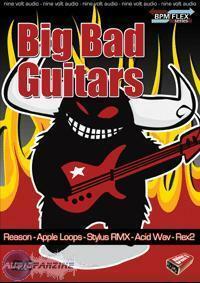 Nine Volt Audio introduces Big Bad Guitars, the brand's new collection of guitar loops. 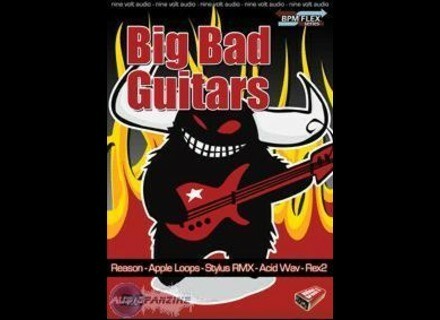 According to Nine Volt Audio, Big Bad Guitars is a collection of tough and heavy-duty modern rock guitar loops aimed at turning any track into a bruiser. With aggressive and intense tones, all parts were recorded on two guitars through different amps, allowing for a wide spread of stereo six-string sound. Amp sounds were dialed in and recorded by producer, mixer and engineer Michael Wagener, known for his work with many hard rock and heavy metal bands like Motley Crue, Ozzy Osbourne and Metallica. As part of Nine Volt Audio’s BPM Flex Series™, every REX-based loop in the collection can be used at virtually any tempo without artificial stretching or unwanted audio artifacts, making this collection a very flexible modern hard rock guitar library. All in all, featured file formats include REX2, Stylus RMX, Apple Loops and ACIDized Wav. More information as well as a video demo can be found at Nine Volt Audio's website. DSK Music Ethereal PadZ [Freeware] This week's freeware is a virtual synth specialised in pads from DSK Music. Waves V6 Now Available Waves has announced that version 6.0 of its product range is now available. Waves adds G-Channel plug-in to SSL 4000 Waves Audio has announced the release of SSL G-Channel, a brand new addition to its SSL 4000 Collection.